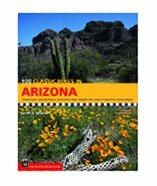 The best reviewed full-color guide to Arizona hikes has now been updated and expanded with the most spectacular canyon, desert, and "sky island" trips in this dramatic state.100 hikes, 10 new to this edition, with color photos and maps. Now includes detailed topographic maps, elevation trail profiles, and a trails-at-a-glance chart indicating distance, level of difficulty, and seasonal considerations. Includes a mix of trails from easy day trips, to never-dull loop hikes, to more remote long-distance treks. No hiking guide captures the beautifully complex and varied landscape of Arizona like Scott Warren's. Thoroughly updated and expanded with useful topographic maps and elevation trail profiles, this third edition of 100 Classic Hikes in Arizona offers a wide range of the state's most scenic hiking trails. You can stand in a mile deep canyon one day, hike through a saguaro cactus forest the next, and stand on a nearly 10,000 foot "sky island" in the Chiricahua Mountains yet another day. You can hike Lenox Crater, an actual volcano with a nearby lava flow, or lose yourself on Dutchman's Trail, a solitary long distance trek in the fabled Superstition Mountains. This classic guide gives you the best trails for both day hikes and overnight backpacking trips in the state.